Whew! We have had a couple of busy, busy weeks in June! High school graduation, tons of patch orders and some awesome new digitizing equipment. We decided that we wanted something really cool to digitize with, different from our Mac’s and our PC computers- which are awesome, but not quite what we want to work with for hours and hours in a day. Over 10 years ago, I had a dream that I would love to be able to digitize more creatively – that is that I could almost draw out the embroidery designs, like with a pen and paper. And that dream has come true, minus the pen and paper of course! Wacom has a few “tablets” that you can use as a secondary monitor. Not a big deal until you realize that the monitors are for use with pens. What does that mean? It means that I can draw out my embroidery designs. Its a dream come true. 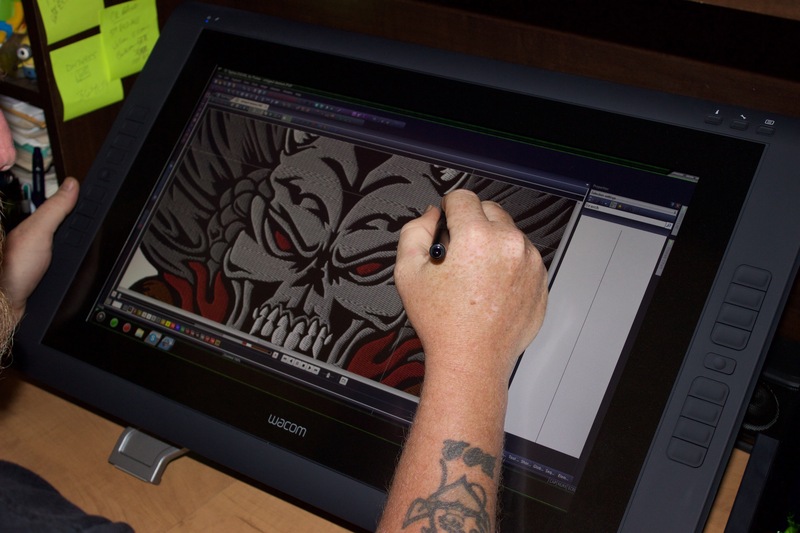 Here is what it looks like in action – working on a cool biker embroidery design meant for a full back on a leather vest. you can see what you are working on, and work directly on it! It is absolutely amazing for embroidery digitizing. I never thought it could be more fun. We have a lefty in house, and every time we get something cool, it doesn’t usually work as well for a lefty – it seems to be a little awkward and uncomfortable. Not this piece of equipment! Wacom has made this perfect for right hands or left hands. And the whole screen tilts to either side so even lefties can find the perfect comfortable working space. 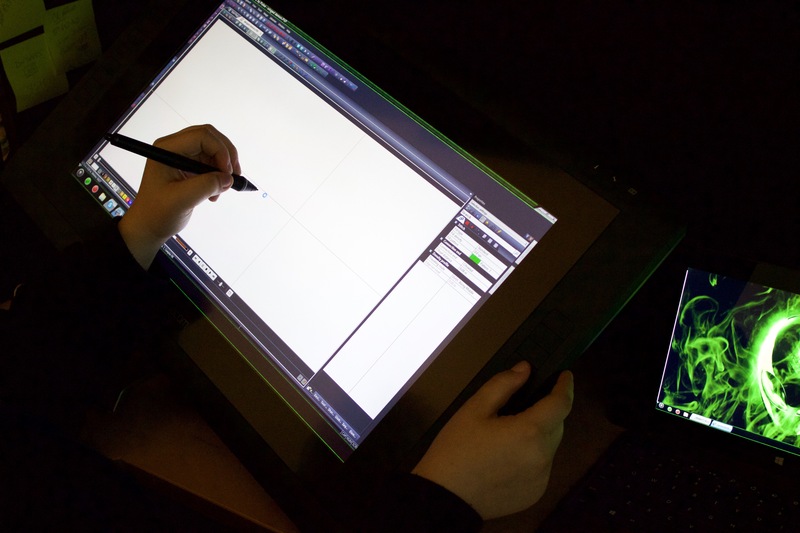 Wacom Cintiq22HD is perfect for left handed people. We are still very excited about our new equipment! I will be writing a more informative blog about our Cintique’s when we have more time to use them and get all those awesome buttons programmed for shortcuts. In the meantime, if you want to check them out, go to Wacom.com and check them out. Embroidery digitizing is life! Now life is even more fun!